Moderate Physical LevelRegular walking or cycling over moderately long, hilly, or bumpy distances. Some public transport or utility vehicles such as safari jeeps. Camping Lodging Level Typically involves most nights sleeping in tents (sometimes permanent tented sites) or in rustic cabins and lodges. Sign inMembers save up to $700 per person on thousands of trips every day and get access to private deals up to 50% off. Log in or join to see eligible deals. It's free! to unlock private member deals up to $700 off. 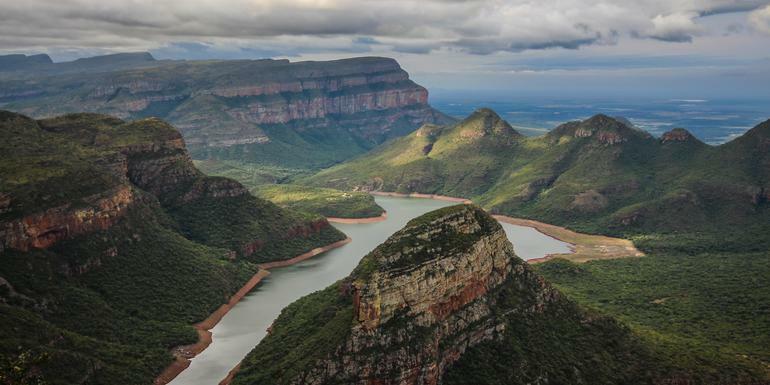 The unvarnished grandeur of South Africa is on display in this comprehensive exploration of one of the continent’s most diverse and fascinating destinations. 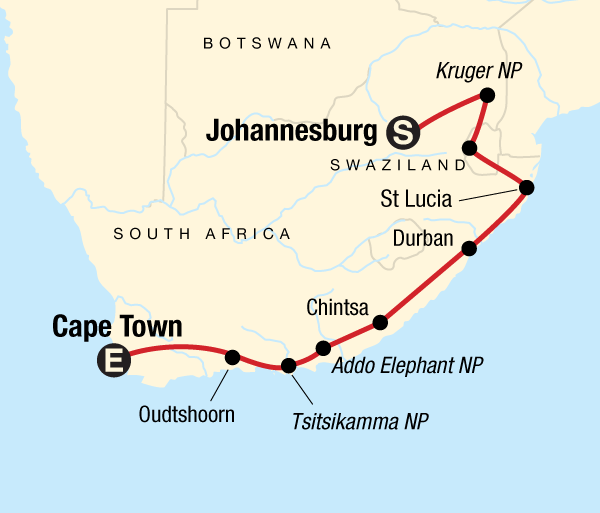 Africa’s incredible culture and wildlife are at a premium on this tour — from the coastal shores of Tsitsikamma to extensive wildlife safari drives in Addo Elephant National Park and the famed Kruger. You’ll also have the chance to visit a traditional Swazi village, explore modern Cape Town, and follow the glorious Garden Route. Add in knowledgeable Chief Experience Officers (CEOs) and some of the best camp meals you’ve ever tasted and you’ve got a recipe for adventure par excellence. It was a great experience! I saw so many animals and so many landscapes. But I didn't expect it like that. I didn't know, that this was a campingtrip and that we have to work (packing, cooking, cleaning) like that. I find it highly inappropriate not to mention this in the explanation of the tour! Get out and explore. Opt to visit the Hluhluwe - iMfolozi Park, which is a safe haven for both the white and black rhino. Lions, buffalo, elephants, and leopards also call this reserve home. There is lots to do around Chintsa. Learn how to surf, take a horseback ride, hike, or enjoy the beautiful 15km (9.3 mi) beach. Opt to join a guided wildlife safari drive, enjoy an elephant encounter, or quad bike through the 4000 hectare wildlife reserve. Embrace your adventurous side and cycle or jump on the bus to Mama Tofu’s Xhosa village for an inspiring cultural experience. Visit the local craft brewery Emerald Vale to taste real home-brewed ale. Only ground transport Private vehicle For this tour we will use a touring vehicle with comfortable seats and sliding windows, this style of transportation is a great way to travel through the region and get a good view the surroundings. When necessary, a trailer will be used for your luggage, and the tour gear. Please note these vehicles may not be air-conditioned. This is not a physically demanding journey; however, travelling can be difficult, with long drives and poor road conditions at times. Please take note of the travel times and distances in the above itinerary, and consider that this is often on poor quality, bumpy roads. Despite this, most clients feel that the diversity of the African landscape, culture and wildlife are all well worth the experience. Simple hotel (1 nt), participation camping (13 nts), hostel (2 nts, multi-share). Camping in Africa is truly an adventure. You will be able to get off the beaten track to get a first-hand experience of the beautiful wilderness and nature. While camping, we stay at designated campsites in national parks and outside towns. Campsite facilities in southern Africa are generally good, but can be basic in certain places. There are generally small restaurants and/or bars, washing facilities and occasionally telephones available. The camps have flush toilets, and showers at some camps are outdoors, having simple reed enclosures for privacy. Additionally, warm water is available at most sites, but it is not guaranteed to always be warm when you take your shower; the warm water may be used up others who also use the camp. We usually set-up camp within close proximity to the toilet facilities, though occasionally to reach them you may to walk a short distance. All camping equipment (with the exception of your sleeping bag and pillow) is supplied, including camp mattresses, which are warm and comfortable. We supply dome tents and assembly/disassembly takes only 5 minutes. They are good quality, durable, industry-standard 2-person safari canvas tents. Please note that most adults will not be able to fully stand up inside the tents, though most travellers find these more than adequate, as they have a base area of approximately 4 square meters. These tents are regularly treated with a waterproofing agent, but under certain rainy conditions, the tent fabric may become saturated to the point where seepage or leakage may occur. All tents have built-in mesh insect netting on the windows and doors. We travel with our own portable camp chairs with a comfortable back-rest, and we utilize our own cooking equipment to provide the group good quality camp meals. In camping within the national parks and conservation areas, some camp sites are enclosed for keeping the resident wildlife out. Other camps are open to the natural environment – care must be taken, especially at night, when a torch/flashlight is recommended when walking around the camp area. Despite the challenge that a few days “roughing it” may pose to some, the experience of being that close to nature, camping under the African stars, and seeing incredible wildlife at your tent door-step is not just gratifying but ultimately an experience of a lifetime. In Durban, we stay in backpacker's (hostels) or small guest houses, which will give us a break from camping and to be better located than the campgrounds in the area. Here, the accommodation is based on several people sharing dormitory-style rooms, with possibly 6 to 8 people sharing a room. Although we will try, we cannot guarantee to be able to divide the group into different dormitories based on gender lines. As such, males and females may have to share the same sleeping quarters for these nights. The bathrooms and showers are private, but may also be shared between both males and females. Guides 2 Chief Experience Officers (CEOs) throughout as head guide/cook and driver, local guides. Min. Age: Minimum age of 18 years for this trip. 1. This is not a physically demanding journey; however, travelling can be difficult, with long drives and poor road conditions at times. Despite this, most clients feel that the diversity of the African landscape, countries, culture and wildlife are all well worth the experience. We use a comfortable and safe customized safari vehicles for the long drives. 2. South Africa requires all travellers journeying from yellow fever risk countries to show proof of Yellow Fever vaccination by means of a valid Yellow Fever certificate. 3. Your trip includes an element of participation camping. Your CEOs will do all the majority of the meal preparation, but we do ask the clients to help with the setting up of camp, some meal preparation, and washing up. It is all part of your adventure and when everyone puts in a little effort the trip will run smoothly and the team spirit is part of the fun! All camping equipment (with the exception of your sleeping bag and pillow) is supplied. We supply dome tents and assembly/disassembly takes only 5 minutes. All tents have built-in insect nets. Mattresses are also provided, which are approximately 4cm thick, warm and comfortable. 4. Sleeping bags cannot be rented on any of our Africa overland or safari tours. 5. VISAS. Please read the Visa section very carefully. Visas are your own responsibility. Always double check with the embassies what each countries requirement are. 6. Water-wise tips when visiting Cape Town: Cape Town is currently experiencing one of the worst droughts it has seen in over 100 years, and while we want you to have the best time possible while there, here are some tips to help reduce your water usage: - Bring a reusable water bottle, that you can fill with Cape Town’s tasty tap water. - Reuse your towels in the hotel, for at least two days, before getting new ones. - Keep your laundry until you have a full load to do, rather than just doing a handful of items. - Turn off the tap when brushing your teeth, or shaving. - Keep your showers to two minutes or less, and don’t use the bath. - Use hand sanitizer, instead of washing hands. 7. Please note that this tour combines with other G Adventures tours. As such, the staff and some travel companions on your tour may have previously been traveling together with G Adventures, prior to Day 1 of your tour. Likewise, some staff and travel companions may be continuing together on another G Adventures tour, after your trip concludes. 8. DRONES The use of drones in national parks in Southern Africa is prohibited. As mentioned above, most of the meals on this tour are included in the tour price. When a meal is not included, this is because there are often many options available - we would like to give you the opportunity to explore a bit and test the local cuisine yourself. In these cases, your CEO will be able to suggest some good local restaurants or options for you to choose from. All included meals will be prepared from fresh local produce. The majority of the shopping for foodstuffs will be done before the trip departs, and fresh goods, such as meats, fruits, vegetables, and dairy products, will be bought en route during the trip from supermarkets, local shops and markets. Breakfasts will generally consist of breads and cereals, if time allows a warm breakfast may be prepared. Many lunches will be provided en-route and will be light meals such as sandwiches and/or salads. All evening meals will be freshly-prepared hot meals, and will consist of a variety of continental and local dishes. Our cook will organize the meal preparation and lead the way here, but will prepare a duty schedule for ensuring a fair, rotating participation from you and your group members in the meal preparation and dish washing duties. Vegetarian meals and other dietary requirements need to be specified prior to arrival. The information in this trip details document has been compiled with care and is provided in good faith. However it is subject to change, and does not form part of the contract between the client and the operator. The itinerary featured is correct at time of printing. It may differ slightly to the one in the brochure. Occasionally our itineraries change as we make improvements that stem from past travellers, comments and our own research. Sometimes it can be a small change like adding an extra meal along the itinerary. Sometimes the change may result in us altering the tour for the coming year. Ultimately, our goal is to provide you with the most rewarding experience. Please note that our brochure is usually released in November each year. If you have booked from the previous brochure you may find there have been some changes to the itinerary. VERY IMPORTANT: Please ensure that you print a final copy of your Trip Details to review a couple of days prior to travel, in case there have been changes that affect your plans. Rules & Other Requirements Illegal drugs will not be tolerated on any trips. Possessing or using drugs not only contravenes the laws of the land but also puts the rest of the group at risk. Smoking marijuana and opium is a part of local culture in some parts of the world but is not acceptable for our travellers. Our philosophy of travel is one of respect towards everyone we encounter, and in particular the local people who make the world the special place it is. The exploitation of prostitutes is completely contrary to this philosophy. Our CEOs have the right to expel any member of the group if drugs are found in their possession or if they use prostitutes. A vast selection of trips on every continent, for every style. Thousands of itineraries from hundreds of trusted travel companies. Use simple search and comparison tools to easily find the best trip. Don't sweat the logistics -- travel providers plan for you. Book directly with the operator. Find inclusive packages for the best value and get access to amazing deals. Read unbiased user reviews, pick the company that fits your style, and connect with them directly. No worries, just memories. Our Stride Select trips allow you and your travel companions to save up to $700. You wouldn’t want to miss that, right? Stride is the top reviews site for experiential travel and tour packages. Now you can search tens of thousands of trips from more than 1,000 operators and expert trip planners. Most travel agencies and websites only show options from large companies that pay big commissions. We show you all the options we can gather. We want you to have all the information to find your perfect trip, no matter who it’s with. About us. Search thousands of itineraries and match your style and budget. Compare local experts with global tour operators side by side. Read reviews by travelers and experts. Save money as a Stride member (its free), with exclusive deals & rebates. ...to help more people travel further, travel more, and travel better. Learn more.